Sabic Innovative Plastics is introducing a new Expression 2011 palette, described as a dazzling array of resin colours and special effects for light emitting diodes (LEDs). The colourful new palette is designed in response to customer demands for better, longer-lasting LED life and improved efficiency. To expand the design potential of LEDs and encourage adoption of these energy-efficient light sources, Expression 2011 elements are said to give lighting designers exciting new sources of inspiration and a clear competitive edge. By influencing light transmission, diffusion and colour, these materials spark innovation and epitomise Sabic Innovative Plastics' success in helping customers create stylish, distinctive and differentiated products. Egi van der Veeken, an aesthetic specialist at Sabic Innovative Plastics, comments: "The Expression 2011 program validates the tremendous potential of LEDs for advanced design and for energy conservation. Sabic Innovative Plastics can help LED technology achieve new levels of design creativity, efficiency, sustainability and practicality for multiple industries ranging from automotive to mobile devices. The Expression 2011 portfolio encourages designers to take full advantage of the different moods, effects and spectrum of colours it offers to run with their ideas and explore all the vast possibilities this new technology can offer." The new Expression 2011 collection showcases the versatility of different Lexan resin grades for enhancing LED light. Lexan Visualfx resins in three neutral white colours – Minor Vision, Midway Gauzy and Mighty Pure – offer three different levels of transparency and light scattering. Opalescent colours of Lexan SLX resin in pale blue tones further reduce light transmission for a softer appearance. Colour punch is delivered with high-chromatic Lima and Icy Mango shades in Lexan EXL Visualfx resin, while strong, dense hues are displayed in Cerulean (medical-grade transparent Lexan resin), and Emerald Forest and Venetian Cherry (optical-grade transparent Lexan resin). Colours can be matched to the CIE 1931 xyY Chromaticity Diagram. 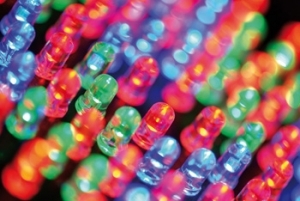 In addition to developing the Expression 2011 palette for aesthetics, Sabic Innovative Plastics provides a wide range of specialised resins and compounds that help to raise the performance and extend the useful life of LEDs. For example, the company's Extem resin portfolio of amorphous thermoplastic polyimide (TPI) and polyetherimide (PEI) resins provide high thermal resistance up to 311C Tg and are inherently flame retardant without use of halogenated additives. LNP Konduit compounds, with exceptional conductivity performance, can conduct heat away from LEDs into a heat sink or the surrounding air. Halogen-free flame-retardant LNP Starflam compounds offer insulative properties and can be formulated to meet electrical standards, such as the IEC 50595 glow-wire test. Transparent Lexan XHT resin offers higher thermal performance than standard polycarbonate, making it suitable for many clear lighting applications.